I didn’t have to work on Thanksgiving but it wasn’t because of pilgrims, Indians, cranberries or pumpkin pie. A few days before Thanksgiving we received a welcomed email. Our school had been selected to host a national Turkish test and classes would be cancelled on Thursday. Although the forecast showed a rainy, cool day, this unforeseen holiday would allow me to go on a walking/photography tour in the massive Grand Bazaar that I’d heard about through a friend. It was tempting to keep the covers pulled up over me in bed that morning, but I forced myself out and I’m so glad I did! Like I’ve said before, every time I step out my front door, I am whisked away into an adventure-filled wonderland and this was no exception. Monica Fritz is a photographer in Istanbul and she knows the ends and outs of the Grand Bazaar like the back of her hand. She’s lived here many years and offers walking tours specifically for people who want to have photo opps in wild and unexpected places. This tour promised its attendees rooftop scenes from the James Bond movie, Skyfall. Rain or shine, I couldn’t allow this opportunity to slip through my fingers so I rolled out of bed and onto the wet streets of Istanbul. 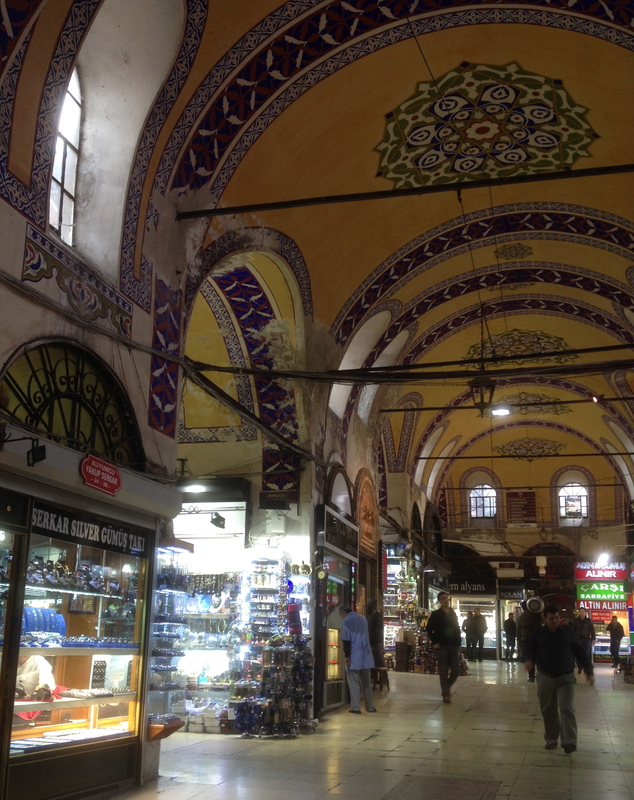 The Grand Bazaar is just shy of 600,000 square feet in size. It is beyond enormous and you can easily get lost inside its maze-like streets. It is the oldest and largest covered bazaar in the entire world. From information inside a brochure I picked up while there, I learned that it has 21 entrances, 66 streets, almost 4,000 shops and employs more than 30,000 people. Mehmet II built the earliest structures after the Ottoman conquest of Istanbul in 1453. It was hoped that the sales from merchants would provide financial resources for Hagia Sophia. For centuries it was the center of commerce, handicraft and finance in the Mediterranean and Near East. The two oldest buildings in the bazaar, called bedestens, provide examples of classical Ottoman architecture. It is so big and so confusing inside, I have been resistant to go there since arriving here in August. I dipped inside once on my vacation here in 2011, but haven’t been back since. It’s intimidating both in it’s size, its confusion of whereabouts and in the way the merchants call out and haggle to passersby. But to go and explore its passageways with someone who knows its secret stairwells and courtyards, and who knows the merchants themselves, would be an entirely different experience. Once inside the maze, I was grateful to have a guide. We entered Gate (entrance) #2, and then twisted and turned ourselves through the silver and gold section, went down a few dark hallways and up shadowed staircases, and then found ourselves in a han or caravanserai. These are beautiful, u-shaped open courtyards that are surrounded by two or three-storied buildings. During the Ottoman Empire, merchants who travelled here from afar, to sell their goods, would feed and keep their animals, such as camels or donkeys, in the courtyards and stay in the inns above. Merchant workshops have replaced the sleeping quarters within the hans, called hucre (cell) and they face the rectangular inner court. Monica knows many of the merchants and we were able to photograph them at work on their wares and leisurely shop in their cramped quarters. Monica took us off the beaten trail. We didn’t see many people in these quiet courtyards and hallways. The majority of the public was shopping in the buzzing, loud, main streets of the bazaar. 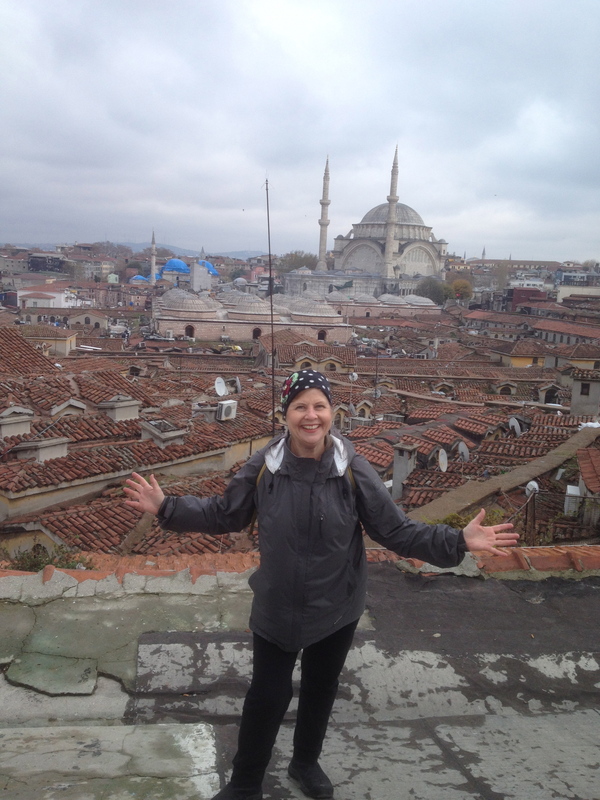 During our 5-hour tour, sometimes we’d step inside the main bazaar and go down a few streets, but then we’d twist and turn and go through small, hidden doors and up a few staircases and then find ourselves on the roof, for example! She took us out onto the roof, for spectacular views, three times, but she waited until the end of the tour to take us on the rooftop where the scenes from the James Bond movie Skyfall were shot. It was so amazing! Even under cloudy skies, pockets of sunshine pointed at minarets and the river and its bridges were easily seen. Surprisingly, the roof looks like a street too! Looking down, we could see people walking on the roof sidewalks, just going about their business like normal. We even saw a dog up there walking around! After we came back inside, we visited a few more merchants and then several of us chose to eat a late lunch at a wonderful restaurant called Pedaliza, located just outside the textile area of the bazaar. We were relieved to warm up with corba, ekmek and chai (soup, bread and tea). I hope all my American friends enjoyed their Thanksgiving weekend as much as I did. I am constantly thankful for all that I have, including all the new friends I made on the roof. *NOTE: The ad below is placed on my blog by WordPress. I do not have any opinion or association with the ad. Please do not “click” it. Thank you. Anita, I am late on this one, but so glad you mentioned it to me and my search was successful. I would not have wanted to miss this blog. what an experience”! Hey, Melanie! Thank you so much for the encouragement! I’m glad you enjoy the blog. I hope you’ll read more. Yes, you need to look up Monica Fritz Walking/Photography Tours’ Facebook page and “join”. I hope to see you at the PAWI Christmas luncheon on Saturday!